Widely acclaimed and much loved, William McIlvanney (1936-2015) has been at the forefront of the Scottish literary scene for decades. Poet, writer of non-fiction and novelist, McIlvanney had his first taste of publishing success in 1966 when his debut novel Remedy is None was awarded the Geoffrey Faber Memorial Prize. This was to be the first in a long line of awards for McIlvanney, which included both the Saltire and Whitbread Prizes for his novels and two Silver Daggers for his crime writing. 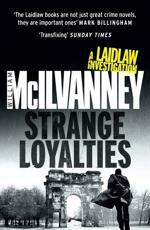 Born in Kilmarnock to a mining family, McIlvanney's working class heritage lies at the heart and soul of his writing. Throughout his career he has endeavoured to create an honest and truthful literary representation of Scottish working class life, something which, as a student at Glasgow University, he saw as lacking in existing literature. McIlvanney was a firm favourite at the Edinburgh International Book Festival, where he regularly held sell-out audiences spellbound with readings of his work. McIlvanney sadly passed away in December 2015, but his work and legacy live on. Read an interview with William McIlvanney in The Scotsman.